You will be amazed to hear that denim jeans were first designed as work jeans. But over time it has become an absolute fashion essential. Every millennial has at least a few pairs of denim jeans in their wardrobe. Denim jeans come in a variety of color and style. They are suitable for men, women, children everybody. Boyfriend denim jeans are a type of denim jeans that can be used to attain both a casual and classy look. This denim is different from skinny jeans. Unlike the skinny jeans, they let your legs breathe as they don’t stick to the legs. Boyfriend denim can be paired with various outfits. 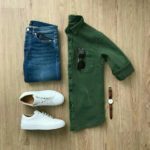 If you are wondering about how to achieve both classy and chic look with your boyfriend denim jeans, then this article is for you. 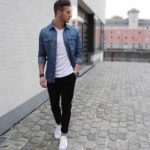 In this article, I am going to help you to choose different stylish boyfriend jeans for every occasion. 10 Stylish White Shirt Combination For Men. The first day of college is very important for every girl. Everybody wants to make the best first impression of their new classmates. 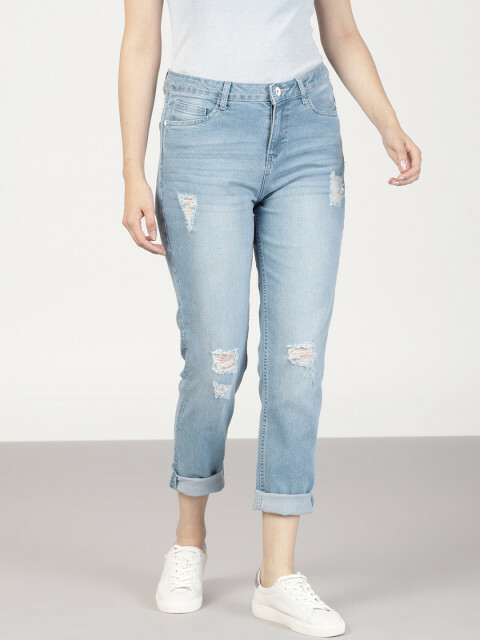 So, if your first day of college is approaching fast and you can’t decide what to wear, you go with boyfriend jeans for women ripped. These jeans give an absolute casual look which is the best look for the first day of college. You can pair them up with a nice white baggy t-shirt and an over-sized goggle. These ripped jeans are very trendy nowadays and youngster loves them because of the cool and casual look these jeans manifest. You can wear these ripped jeans not only on your first day of college but also for the casual outing with friends. 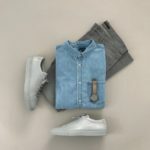 You may not always be in a mood to carry a casual look and then you may want to leave that boyfriend denim of your in the wardrobe. But you can get an ethnic look with your boyfriend denim jeans. Patches on jeans are the most trendy fashions last one decades even in women too. All you have to do is to choose colored printed boyfriend jeans, any color of your choice, and pair them with a high-neck, light-colored, gorgeous-looking, long kurta. Kurtis is very much in fashion nowadays and the combination of Kurtis and denim brings out an elegant ethnic look. You can accessorize the look with a statement neckpiece. This is a look that you can carry everywhere from college and office to wedding receptions. Many celebrity designers have experimented with denim jeans. Designer denim is a little bit expensive than other denim jeans, but it can get the best quality, you have to spend some extra penny. If you have lots of boyfriend denim in your wardrobe and can’t figure out how to style the, here is a tip for you. You can pair your best designer boyfriend jeans with stripes. Be it a striped shirt or a striped t-shirt, stripes always work with denim. You can accessorize the look with some high heels or even sneakers, depending on what you are comfortable wearing. This is a look that you can carry everywhere. If you have skinny legs and you are wearing skinny jeans, you are doing a big fashion mistake. Skinny jeans make your skinny legs look skinnier. So, you should get some pants that can create the illusion of well-built legs. And boyfriend jeans are the best jeans to do that. If you want to get a classy look, you can pair this boyfriend denim with an off-shoulder top. An off-shoulder top will add a different charm and elegance to this look. You can try different colors on a top. To accessorize the look, you can use a plain choker and a light shade of sunglass. You will find the best boyfriend jeans for skinny legs both on e-commerce websites and markets. Until and unless you have been living under a stone you will know that low cut boyfriend jeans are quite a trendy fashion nowadays. The trend of low cut boyfriend jeans is so popular that celebrities all around the globe seem to be following this fashion trend. It is also the absolute favorite among today’s young generation. Boyfriend fit cropped jeans are the low-cut types of denim that look amazingly stylish and funky when worn underneath a denim shirt. You can also wear a cropped jean pairing it with a solid white and black t-shirt and a denim jacket. This look is inspired by the airport looks of the celebrities. Next time when you are running to catch a plane, you can give this look a try. If you have to attain a meeting in your office and want to get a formal look with your top brands of boyfriend denim jeans, you can get it. Only if you choose the jeans from the right brand and the right formal shirt for them. Distressed jeans are the best way to attain a formal look. You can pair the distressed cuffed boyfriend jeans with a solid formal shirt and a blazer. This look will never fail to create a strong and serious impression on your co-workers. 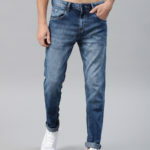 There are various brands from where you can get this boyfriend denim, but you should always choose the top brand. Many jeans lovers want to buy the best quality and the best brand of jeans. But little has the idea of where you will get it with good cashback offers. You can buy from the Amazon, NNNow, Shein, Ebay, Zara, etc. You will get the 80% to 30% Off and if you do the online credit or debit card transactions you will get the extra cash back on your purchase.